Non-native trout in alpine lakes and a fungal disease have diminished the mountain yellow-legged frog population by 93 percent in the Sierra Nevada. 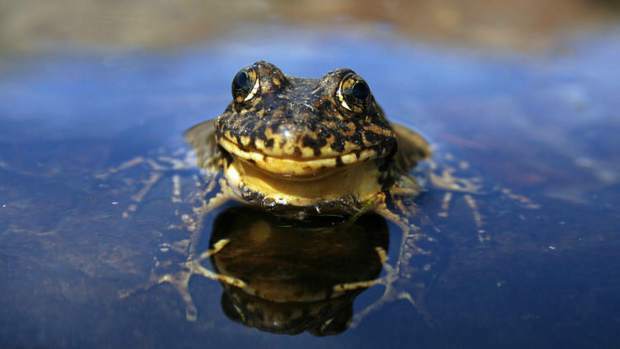 Knapp will be giving a presentation on the recovery of the mountain yellow-legged frog at the Tahoe Center for Environmental Sciences building at 291 Country Club Drive, Incline Village, on April 6 from 5:30-7 p.m.
A $5 donation is suggested. Refreshments and a no-host bar begin at 5:30 p.m. and the presentation begins at 6 p.m. Please register at tahoe.ucdavis.edu/events. INCLINE VILLAGE, Nev. — The mountain yellow-legged frog was once the most abundant amphibian in the Sierra Nevada, but today its population has diminished by 93 percent. Despite these staggering statistics, one scientist, who’s devoted 20 years of his career to the species, believes recovery is still possible. 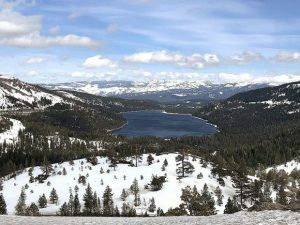 For Roland Knapp, research biologist at the University of California Sierra Nevada Aquatic Research Laboratory, it’s all about striking a balance — specifically a balance between alpine lakes that contain non-native fish and fish-less habitats for the frogs. Introduction of non-native trout started with Euro-American colonists in the 1860s, but escalated in 1950 with the advent of aerial fish stocking. Coupled with the arrival of amphibian chytrid fungus in the 1960s and 1970s, the population of mountain yellow-legged frogs was decimated. The fungus causes the frog’s skin to thicken, interfering with their ability to absorb water and regulate respiration. “That is a novel pathogen to California, certainly a novel pathogen to species like mountain yellow-legged frog. 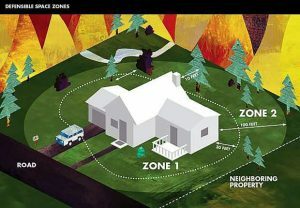 It spread across the Sierra Nevada with devastating consequences,” said Knapp. The mountain yellow-legged frog was added to the federal endangered species list in 2014. But, according to Knapp, there are several factors that he believes will aid in the restoration of the population over time — and there is new research to back it up. “There’s definitely been a change in the last 10-15 years where we’ve seen what looks to be the bottoming out of that decline, where the agencies — especially the California Department of Fish and Wildlife — have become more aware of the effects of non-native fish, so are working much harder to find a balance between providing recreational fishing opportunities and providing some fish-less habitats,” said Knapp. National Parks banned all fish stocking in 1991, while other agencies in the Sierra are creating some fish-less habitats either by halting restocking in certain lakes or physically removing fish from them with nets. A study of mountain yellow-legged frogs in Yosemite National Park released last October in the Proceedings of the National Academy of Sciences showed that the frog population has grown at a rate of 11 percent a year since fish stocking was banned. Further, researchers are finding that some frog populations are beginning to recover despite the ongoing presence of the fungus. From 2013-2015 Knapp and his team conducted a series of translocations and frog reintroductions in the areas around the Upper and Lower Echo lakes; they recently received another three-year grant to continue the work this summer. “It’s not like the whole ecosystem crumbles when the frog disappears, but we have to remember that the mountain yellow-legged frog is a top predator … and losing a top predator can have pretty fundamental effects on the ecosystem as a whole,” explained Knapp. Visit http://www.mylfrog.info to learn more about the species and Knapp’s research.